Insarabasab is another authentic Ilocano dish. It is also a process of cooking that involves cooking the meat over live wood-fire or over charcoal. The word insarabasab literally means to place something over open fire. This Insarabasab dish however, is different from your grilled liempo or barbecued meat in so many ways. The part that is mostly used in insarabasab is the face part of the pig including the ears or areas where there are thin layers of fat and meat in it like the pork shoulders. The meat is not boiled before grilling and they are not marinated in any way. The meat are usually just washed and are placed over direct fire, first to remove the hairs, and second to cook it for a few minutes until there is no pink color in the meat. Insarabasab . The meat are diced and seasoned with salt and an acidic solution made of vinegar and/or kalamansi. It is almost similar to the dinakdakan . Dinakdakan is another Ilocano dish that is a mixture of grilled or boiled meat and mixed with mashed animal brain or mayonnaise. The insarabasab however do not use brain. 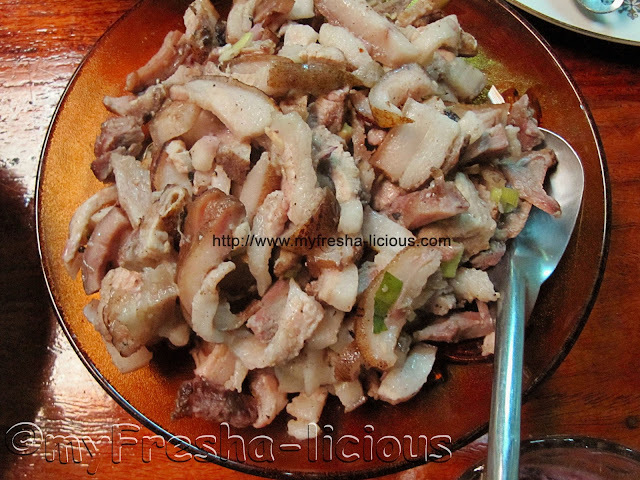 It is also almost similar to Sisig in so many ways. Below is an easy way of cooking Insarabasab. Like kinilaw, dinakdakan, and sisig, insarabasab is a delicious pulutan (beer / alcohol companion). Check our kinilaw recipes ,dinakdakan recipes, and sisig recipes for comparison. 1. Wash the pork and drain. 2. Roast pork in an open fire until the meat is cooked or once the pinkish color in the meat disappears. 4. Blend the rest of the ingredients together and pour over the roasted meat. - All photos, texts, and anything published in this site is owned by the Authors of myFresha-licious.com, unless otherwise mentioned. ALL RIGHTS RESERVED. NO COPYING, NO REPRODUCTION OF ANY KIND IS ALLOWED WITHOUT PRIOR WRITTEN PERMISSION FROM THE AUTHOR/s.